Lots of sportbikes, even vintage sportbikes do many things well: handling is almost always part of the package. Many are very fast, some are reliable, and a few will even take you on long journeys in relative comfort. The Kawasaki Z1R TC does only one of these things, but it does so with such enthusiasm that it’s hard not to give it a pass on the others. 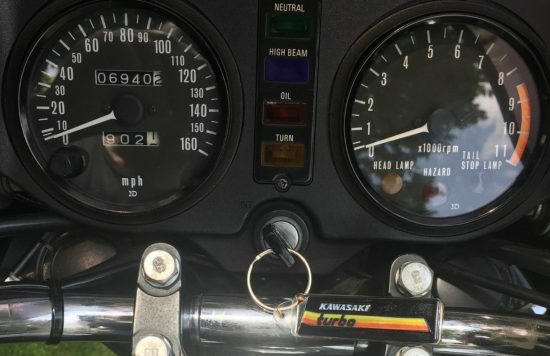 In the 1970s, Kawasaki built bikes that seemed to be in-tune with the American Psychology of Going Fast that stressed straight-line speed over handling prowess, very much like musclecars of the era. Their H1 and, to a lesser extent, H2 two-stroke triples had power that easily overwhelmed their limp chassis and got miserable gas mileage, but that hardly mattered for folks interested in beating the car or bike next to them away from a stoplight. The four-stroke Z1R had acceptable handling and decent brakes, but slap a big, uncivilized turbo on there as seen on the TC and all that went out the window. 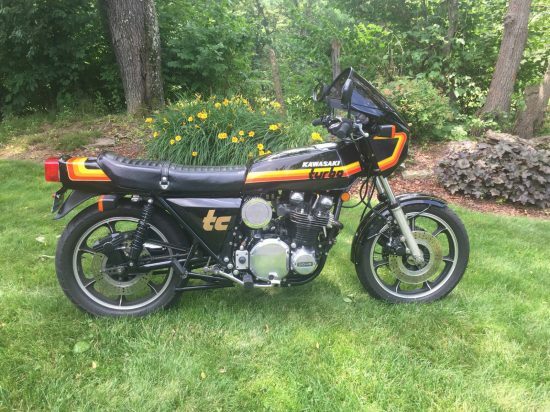 The Z1R TC was the first bike of the turbo craze that afflicted all of the Japanese manufacturers to a certain extent in the 1980s, a trend that was largely a dead-end at the time. Modern turbos are refined and smooth, giving us engines with durability, increased power when you need it and good gas mileage when you don’t, all with minimal lag. These characteristics are largely the result of modern fuel injection systems and the electronics that control them. Both of which are missing here. Early turbo engines needed to have low compression-ratios so they wouldn’t explode when the boost was up, which exacerbated “turbo lag,” the delay between when you put your foot to the floor and when the power kicks in, a result of the turbo needing to time to spin up and begin generating boost and thus power. Turbo lag was notoriously tricky to manage in sports cars of the era and is even more challenging when combined with skinny tires, marginal handling, and the lean angles you’re looking at when riding a motorcycle aggressively. 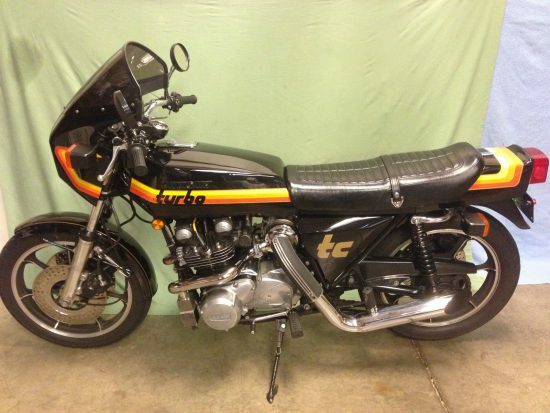 I have decided to sell my dream bike of my younger years. If you know what you’re looking at and your youth was in the late 70’s and early 80’s this bad boy was likely on your wish list along with Farrah Fawcett and the Whale Tail 930 Turbo Porsche. Next to Farrah this was the wildest thing you could throw a leg over! What more could a bulletproof wild child ask for? Make no mistake this bike was the things fantasies were made of and the tool required to make them come true. Much like the efforts that delivered the Shelby to Ford, Motion and Balwin cars to Chevrolet and the Hurst Hemi’s to mother Mopar, Turbo Cycle and Kawasaki teamed up to build a two wheeled rocket that would clean the clocks and wallets of whoever stepped up to the line against it. This bike is all original with a copy of the original sales certificate registered in the archives of Turbo Cycle confirming this is the matching numbers motor and frame and truly one of the original 250 produced. All original manuals are included as are all original parts less the Warblo fuel pump that was long gone when I bought the bike nearly 10 years ago. The bike is shown with and currently runs a newer Mikuni flat slide and K&N air filter but the original Zenith carb and triangle air filter are included. 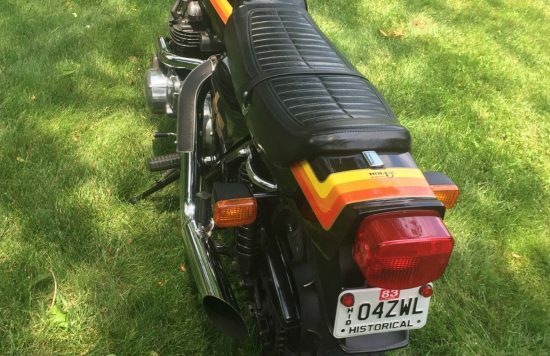 The bike is shown with the white tank emblems and shorter LTD shocks on the rear but again the originals are included and in excellent condition. 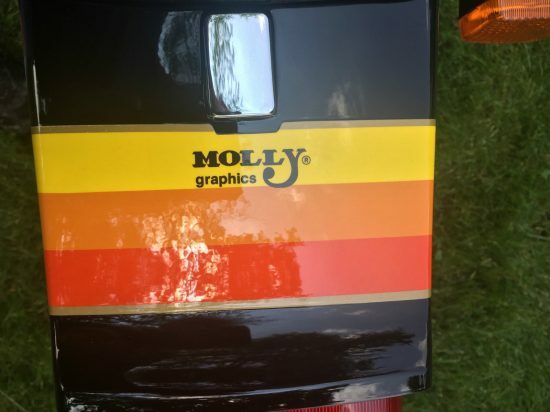 The bike has newer tires, battery and had one quality repaint years before I bought it with new original Molly Graphics. This is not a kit/clone or wanna be-it’s the undisputed real deal that any collector or museum would be proud to own and display. The bike runs great and is a piece of styling art to behold. Mad Max would be proud to spool it up down under. When this old girl comes on the boost you better have your toes under the shifter and brake levers and a firm grip on the bars because just like when you hit hyperspace playing Space Invaders things are going to get blurry in a hurry. This thing is no game or toy-it is still scary fast. While I had had the privilege of owning I have displayed it a many vintage / classic bike shows and was honored to be invited to display it at the AMA display and the Kawasaki featured marque display at Mid-Ohio Vintage Bike Days a few years back. The bike deserves to be on display and in the hands of a curator to insure this piece of history is enjoyed and around for years to come. It’s not clear if the engine in this bike has had any serious work done from the listing, or if it had the upgrades installed originally, but it appears to otherwise be in excellent condition: many that come up for sale are pretty rough cosmetically, seemingly the fate of many Japanese bikes of the era. 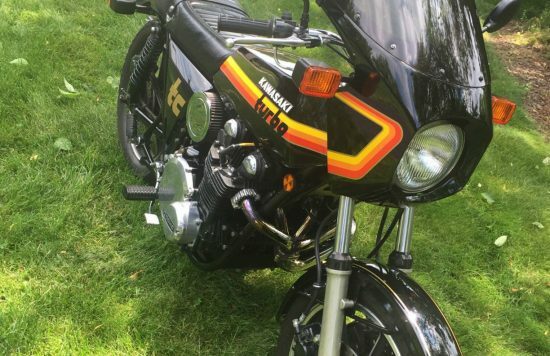 The seller is looking for $25,000 as a Buy It Now price, which is top-dollar, but these are certainly some of the rarest and fastest streetbikes of the era and have been steadily increasing in value.